Donald Trump's nominee for the post of World Bank president has been a critic of multilateral institutions. The Trump administration made the global economic community extremely uneasy last week by nominating a conservative economist as its candidate for the post of World Bank president. 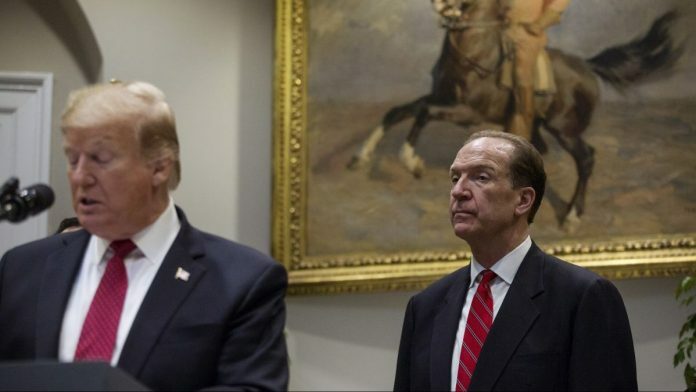 Trump’s nominee, David Malpass, was once an economist at Bear Stearns, the Wall Street investment bank that was one of the first to collapse during the 2008 financial crisis. But it is not just his role at Bear Stearns that makes Malpass a controversial choice for this role. Over the years, Malpass has been a fierce critic of multilateral institutions such as the World Bank and the International Monetary Fund (IMF). Malpass, a Michigan native, has the reputation of a “well-versed economist” with a deep sense of international affairs and macroeconomics. Before joining the Trump administration, he had already worked for the US government in two different stints, as part of the Ronald Reagan and George H.W. Bush administrations. After his job with the Bush administration, the chief economist at Bear Stearns, Larry Kudlow, picked Malpass to cover “global economic trends”. Currently, Kudlow is Trump’s top economic adviser. Malpass worked at Bear Stearns for the next 15 years, until the financial crisis hit America, and his investment bank essentially collapsed. He did not escape from some of the criticism for allowing Bear Stearns to hit this position. Financial Times reported his critics as saying that his record at Bear Stearns “included controversial prescriptions, visceral criticism of multilateral institutions, and reassurances about the state of the credit markets even as his own investment bank was unravelling”. What are his economic views? Malpass is a supply-side economist, and his core beliefs thus involve prescribing low taxes, minimal regulation, and a stable money supply. What make him a controversial figure are his unorthodox views on subjects such as exchange rates. Malpass is a staunch supporter of fixed exchange rates. While this view is not uncommon, it is highly unusual for someone who will be heading the World Bank in today’s global economy. Over the years, the political economy of macroeconomic aspects— such as monetary and exchange-rate policies — have practised a sort of natural evolution. Among the top economists heading institutions such as the World Bank and IMF, there is a near consensus that floating exchange rates are the most preferred option. They argue that floating exchange rates have two clear advantages — they allow monetary policy to be used for domestic purposes, and are better shock absorbers during an economic crisis. An example of Malpass’ economic prescriptions came during the Mexico Peso Crisis of 1995. As Mexico sank into a deep currency crisis, Malpass suggested that the country buy every single peso from the global foreign exchange markets, and re-peg its currency. His suggestion rattled American Treasury officials and the Mexican embassy alike. Malpass emerged as a fierce critic of the IMF during the 2001 Argentine crisis. Furthermore, he mounted a critique of all multilateral institutions, arguing that multilateralism “has gone too far — the point where it is hurting US and global growth”. One can make a reasonable argument that Malpass’ views on the IMF and multilateral institutions have some merit. But when you look at his views across the macroeconomic spectrum, he emerges as a highly unusual choice for the top developmental bank’s job. We are forced to see his nomination as part of a broader trend under the Trump administration. Trump has undermined WTO, got the world economy on the brink of a trade war, destabilised NATO, weakened several UN institutions, and severely destabilised the transatlantic alliance. The nomination of David Malpass to the World Bank is a continuation of that trend. Previous articleWhat is wrong with the British political system?